Villains and evildoers of Gotham City beware of the Dark Spud! The classic Hasbro Mr. 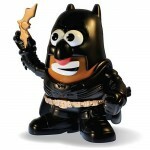 Potato Head comes in Batman’s suit from the Dark Knight Rises movie! The Dark Spud includes The Dark Knight armor, cape, cowl and batarang. Dark Spud stands approximately 6-inches tall and comes in a special window display box. Limited edition. O M G he’s the most adorable batman EVAH. TT games should move onto potato themed games.